New York Times bestselling author Kylie Scott presents two stand-alone novellas in this must-listen collection. 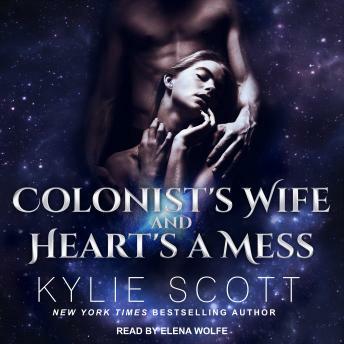 Colonist's Wife: She'll run to the far corners of space to avoid her violent history, hide her true identity, and pass herself off as a mail-order bride. But no one can escape their past forever. And as for her new husband . . . well, he's nothing like she expected. Heart's a Mess: Former wild child Violet has vowed to get her life in order. To find a good job and settle down. To open a savings account and stop falling for the wrong men. But whatever happens, to most definitely not accidentally sleep with her hot, newly single boss.